This week, students across the country rail against program cuts, tuition hikes and racist university policies. What’s next for reproductive justice in Alabama? Could Congress be on the verge of a student new deal? E-mail questions, tips or proposals to studentmovement@thenation.com. For more dispatches, check out earlier posts from January 18, February 1 and February 15. After the Emory University administration announced the elimination and suspension of several academic programs in September 2012, the Student Re-visioning Committee formed to reject the cuts, demand transparency and push for a democratic decision-making process that includes students. The cuts, which were decided by a secretive university committee in violation of university bylaws, disproportionately impact faculty and students of color. The SRC has organized countless rallies, demonstrations, petitions and letter deliveries around the cuts, culminating in a walkout and sit-in outside of President James Wagner’s office, where hundreds of students and faculty remained until an ultimately fruitless negotiation process was initiated. Currently, President Wagner is under fire for his infamous column in Emory Magazine where he cites the Three-Fifths Compromise as an example of a “noble achievement” while referencing the cuts. In the past week, students and faculty have protested Wagner’s address at a civil rights exhibition, circulated a petition for his resignation and passed a vote of censure. A coalition of student groups—Change@Emory, Emory’s NAACP chapter, the Black Student Alliance and the SRC—organized a massive Rally Against Racism on Wednesday to raise awareness and protest structural racism and discrimination on Emory’s campus. At the state’s flagship university in Athens on March 6, undocumented students in Georgia will continue a two-year struggle to end a ban that prevents them from attending the University of Georgia and the other four most competitive public colleges and universities in the state. The demonstration, called Project-U, is being led by a group of undocumented students who have been attending Freedom University, a volunteer organization that offers college-level courses taught by university faculty. These students have also been working to broaden a coalition of civil rights and social justice organizations in Georgia. The Project-U rally will include activists from the Sierra Student Coalition’s Beyond Coal campaign, the student chapter of Amnesty International and UGA’s GLBTQ faculty and staff organization (GLOBES), as well as community groups like Athens Immigrant Rights Coalition and the Economic Justice Coalition. Many of these groups also supported a “Workers Unite” rally last week that kicked off UGA’s Living Wage campaign, calling on the university to waive parking fees for the low-wage workers it employs. 3. New Life for America’s Oldest Black College? On the 157th anniversary of the founding of Wilberforce University, the nation’s oldest private historically black college/university, members of the Wilberforce University Faculty Association and the Student Government Association led a protest of about 100 staff and students demanding the resignation of the university’s president, Patricia Lofton Hardaway, at a community-wide convocation. In the past five years, Wilberforce University’s recruitment and retention rates have declined, tuition has risen more than five percent, student services have been reduced or disappeared and faculty has not received annuities for retirement. In 2011, a group of faculty, staff and students filed a petition with the Ohio Attorney General stating that Hardaway and the Board of Trustees were mismanaging university funds, but the Attorney General dismissed the case in October 2012. The latest action was a continuation of a demonstration on October 24, when an estimated 70 percent of the student body requested withdrawal forms if issues were not corrected by fall 2013. On February 19, the Alabama House of Representatives passed a bill that many think will shut down every abortion clinic in the state and another bill allowing employers with “religious” convictions to deny health plan coverage for contraception and abortion services. In response, the student-led Alabama Alliance for Sexual and Reproductive Justice has started a campaign against these bills. Meanwhile, in response to a forty-day protest at Birmingham’s Planned Parenthood clinic held by “40 Days for Life,” AASRJ members are joining other women’s rights advocates in a counter-protest at the clinic. Meanwhile, on the same Tuesday that the legislation was passed, several law enforcement agencies raided on- and off-campus locations in Tuscaloosa at 4 am after a reportedly two-month investigation. They made seventy-four arrests, sixty-one of them students, mainly for marijuana violations, twenty-eight of which were only misdemeanor charges. Since then, a group of students has begun organizing a demonstration against the excessive use of force by all agencies involved with the raid. In the two years following a “cost-saving” reorganization that reduced the number of student seats on the Connecticut higher education governing board, nearly $100 million has been slashed from the public higher education fund, putting Connecticut in the top ten for such cuts. When the Board of Regents announced in January that tuition increases upwards of 12 percent would be likely, Students of Connecticut’s Universities for Democracy began organizing. A petition demanding no tuition hikes and greater student representation on the Board of Regents has gathered over 400 signatures. Moving forward, Central Connecticut State University is holding a symposium on the cost of higher ed on March 5, leading to a rally on March 11. The major organizing effort underfoot is a massive student walkout of students from all twenty-one campuses under the banner of #hikemeanswalk, in response to the 5.25 percent tuition hikes to be voted on by the Board of Regents on March 21. Last Thursday, hundreds of students at City College of San Francisco rallied, then occupied the administration building. CCSF is facing the threat of massive cuts and even potential closure because of an offensive by the ACCJC accreditation commission, which receives funding from the pro-privatization Lumina Foundation. Students occupied to demand that the Chancellor fight to reverse cuts, demand additional funding from City Hall and denounce the sham ACCJC. Unfortunately, none of the demands were met. Students are now taking their case directly to City Hall for a March 14 walkout and rally. Vanderbilt University has taken steps to withdraw its $26 million investment in EMVest, an agricultural corporation accused of land grabbing, or taking over agricultural land used by local communities through exploitative practices and using it for large-scale commercial export farming, in sub-Saharan Africa. This historic divestment marks the first full divestment made by Vanderbilt in response to student pressure—after it refused to divest fully from funds operating in Apartheid-era South Africa. Following the allegations, students, with support from the Oakland Institute and Responsible Endowment Coalition, met with administrators—who refused to take the issue seriously. After a long campaign, students took up direct action with sit-ins and a two-month long “tent city” in front of the administration building in May. Coming out of the EMVest campaign, students’ focus has been local grassroots organizing around labor and community issues—including Vanderbilt’s contract with Adidas, campus worker justice and Nashville organizing around the CIW’s Campaign for Fair Food. All in the Red is an activist collective focused on the US education crisis. 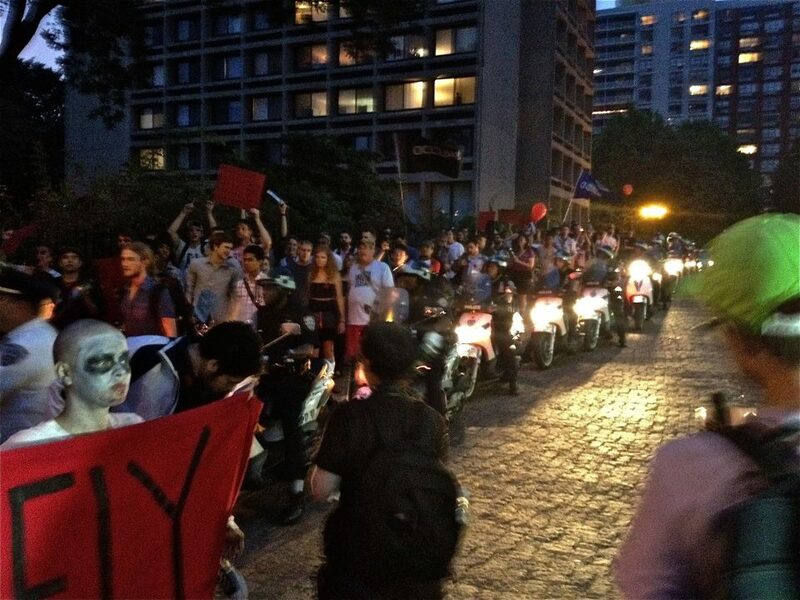 The group emerged in NYC last spring during nightly Quebec solidarity marches inspired by the massive student protests in Canada—which are picking up again this week, with 50,000 students on strike and 13 arrested. AitR combines traditional protest with art and design, aiming to increase public interest, encourage student participation and garner media attention. Its Night of the Living Debt march combined elements of direct action, street theatre and zombie parades. Recently, a second AitR group has formed in Michigan. This spring, both groups will organize among students and collaborate with other activist groups to target policies that limit access to higher education and financial entities that profit from the burgeoning student debt crisis. A New Student Deal is in the works. The United States Student Association and the Roosevelt Institute Campus Network have combined their nationwide networks of student activists to do the work politicians in DC refuse to do: creating a comprehensive package to solve the student debt crisis and provide a path to citizenship for undocumented youth pursuing higher education. The legislation will take a six-pronged approach: a permanent 3.4 percent interest rate for the federal subsidized Stafford loan; mandatory Pell Grant funding; Income Base Repayment as the default option; the ability for private student loan debt to be discharged under bankruptcy law; passing Comprehensive Immigration Reform that will give DREAMers a pathway to citizenship by earning a college degree; and passing the Fair Minimum Wage Act. Students from across the country are currently submitting policy papers detailing the pros and cons of each envisioned component, and will be finalizing the legislative language in preparation for USSA’s national Legislative Conference on March 14. There, students will solicit co-sponsorships and support from legislators for the New Student Deal. Last week, Florida Atlantic University announced a $6 million deal to name its football stadium after the GEO Group, a private prison company owned by an FAU alum that took in $1.61 billion in 2011. After sitting-in at the university president’s office, students from the Stop Owlcatraz Coalition are set to meet with higher-ups on Friday.